There is a very powerful connection between your mind and your success. For instance, increasing your income is largely determined by the limiting beliefs and negative habits that were programmed into your brain at a young age. "All rich people are evil." These phrases seem harmless, but they act as instructions to your subconscious mind. They are the seeds that grow into the limiting beliefs and thought patterns that determine how you think or feel about money today, as an adult. And most of these beliefs have been programmed into your mind for years, so much so that they're practically part of your wiring. It's no wonder why so many of us struggle to earn more money, follow our dreams, or have the relationships we want. Sometimes it's to the point where we don't even feel comfortable asking for or receiving those things when it does come into our lives. 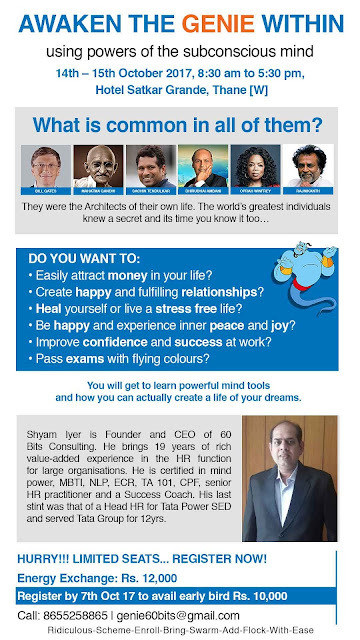 If you've ever felt like there was something holding you back from success that is out of your control, I invite you to check this out incredible live event “Awaken the Genie Within” on 14th and 15th Oct 17 that can help you remove all of the mental or emotional roadblocks that are preventing you from achieving your goals. I've seen it for myself, and it's truly incredible.